Like things that explode? Like things that crumble to dust? Enjoy watching lots and lots and LOTS of unnamed Others get blown away? Then baby, have I got a film for you. 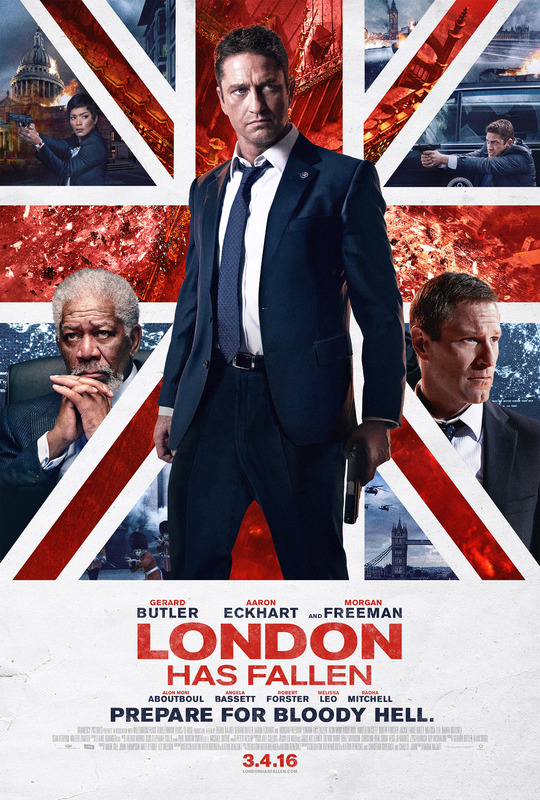 Right off the bat let’s get one thing straight: London Has Fallen is not high art. In fact, it harks back to the ol’ boom-boom-pow American nationalism hyperdrive of films like Rocky IV, Independence Day, and every freakin’ movie Chuck Norris did. This is a movie where you’re supposed to eye people with even the faintest whiff of Middle-Eastern parentage with suspicion, and cheer when the inevitable good-guy payback hits hard. From Morgan Freeman’s ID4-esque “vengeance will be OURS” speech, to Angela Bassett’s Single Tear Of Sadness, this film takes all the cliches, beats you over the head with them, and then sets them on fire. In no way does subtlety or light-handedness come into play here. London has Fallen is about big things, happening to big places, in a big way. Like Don Henley would ask, are you with me so far? Okay, so here’s the story: bad guys kill people. Good guys survive, and kill the bad guys. Sure, I could talk about the Secret Service Agent (Gerard Butler) who’s toying with retirement before a terrorist attack during a funeral attended by several big important heads of state (read: from countries we like) leaves most of those heads dead, and POTUS (Aaron Eckhart) on the run. Why the attack? Because a bad guy got hit by a drone strike years before, leaving his daughter – an innocent – dead on her wedding day. Yeah, that feeling you just got? It’s the screenplay playing whack-a-mole with your feelings. And director Babak Najafi knows how to gather those feels, and crank things up to 11. No, Olympus‘ Antonie Fuqua didn’t return to direct this one. But Fuqua’s skill with layered characters would go to waste here; in London, everything’s black and white, good or bad. But that’s not to say this movie isn’t fun, as long as you understand it for what it is. And London Has Fallen is escapist entertainment of the highest (or lowest) order. You don’t need to think because you know what’s coming next. You don’t need to worry about nuance, because everyone’s painted with the same broad brush. And being unable to follow the plot is not a problem, because it’s just Cowboys & Indians, except the cowboys are wearing suits, and the Indians are…well, still brown. See? Simple! What’s else is good, beside the vaguely unsettling feeling of satisfaction I got when bad guys got mowed down like so much crabgrass? The special effects are outstanding. Seriously; Hollywood has committed itself to making sure that destruction is as realistic as possible, and that realism shines here. Morgan Freeman. Because he’s Morgan Freeman, and anything he does is awesome. The fact that Jackie Earle Haley (Watchmen) is in the mix. He’s a cabinet member, which means he’s not on screen all that often. But it’s good to see him. The cinematography. Why put A++ effects on screen if you don’t have a person who’ll make each shot look epic? Cinematographer Ed Wild (Severance) does. Now if you’ll excuse me, kickass comfort movies that aren’t necessarily great for you demand similar comfort food. And there’s a pan of peanut butter cookies in the oven with my name on ’em. FOR AMURICA. This entry was posted in Movie Reviews and tagged #ActionPr0n, Movie Reviews. Bookmark the permalink.